Sunday: First off let me just apologize for the picture overload! I know it doesn’t take this many photos to show the outfit but that’s what happens when you take them yourself on continuous and you have too many to choose from. Anyways, I digress! Now about the ‘fit. 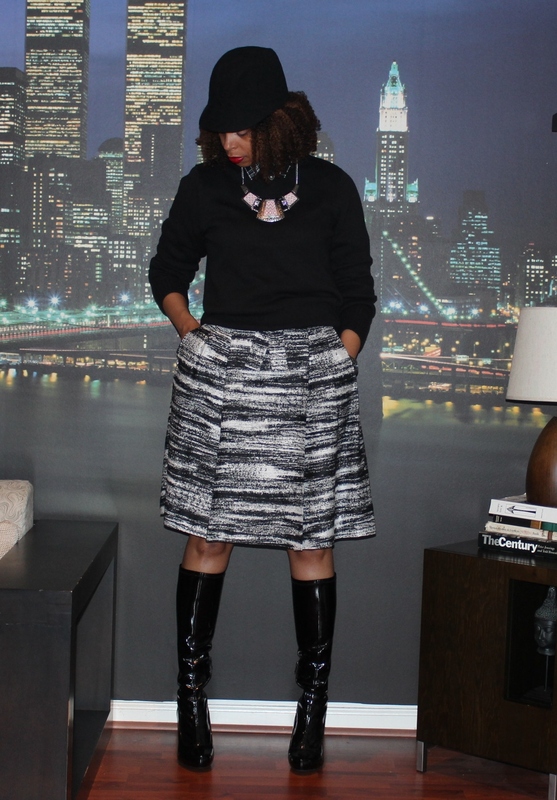 The skirt I picked up from one of my favorite consignment stores. I love that it’s really girlie in shape/cut but has a more modern and graphic print. 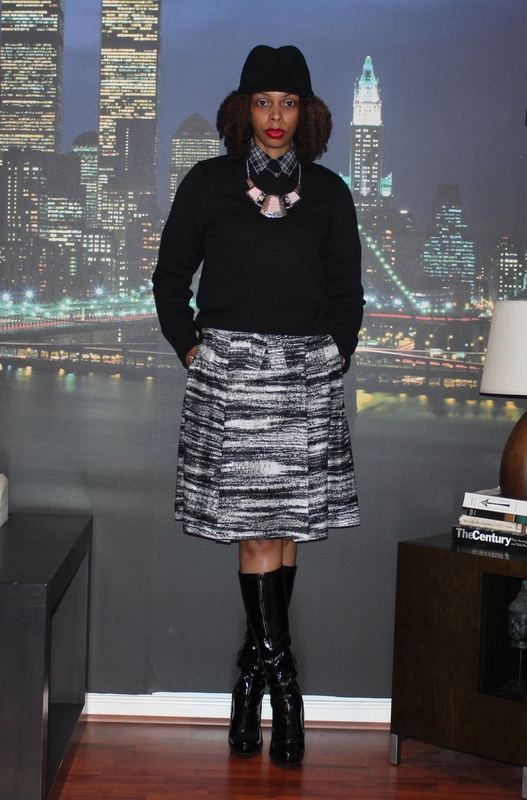 I wore a layered sweater/shirt combo to dress the skirt down a bit. Also, since it was a little rainy and chilly out, the layers came in handy. The boots I’ve had for about 3-4 yrs but had yet to wear them until today. When I purchased them, I got them for bad weather days such as today when you still want to wear a heel but also keep dry. Patent leather is one of those fabrics that you can wear in any weather, rain or snow, and not worry about ruining them. Hope you had a great weekend! It looks like we finally have Spring here on the East Coast! Can’t wait to do some Spring styling. God Bless! Sunday: A quick post of today’s ensemble because I have to get positioned for tonight’s season opener of Drop Dead Diva (on Lifetime). 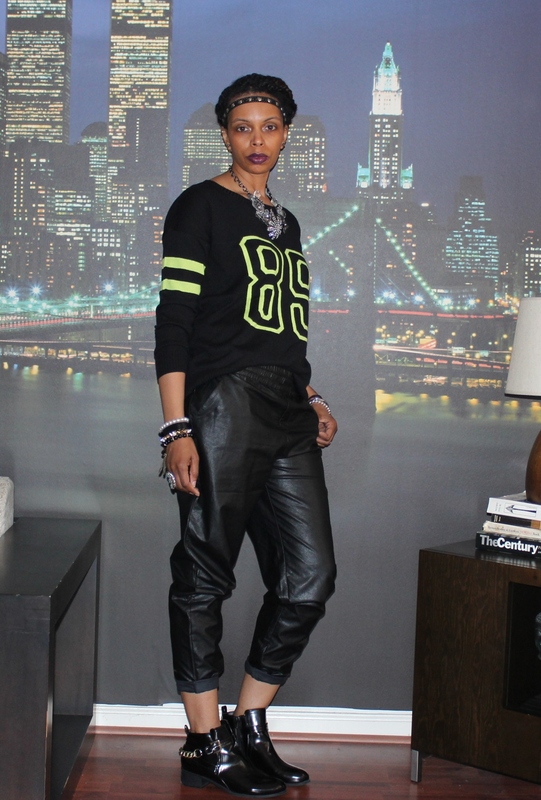 Anywho, another pair of leather-like joggers. These are more straight leg. Worn with a knit that resembles a jersey. 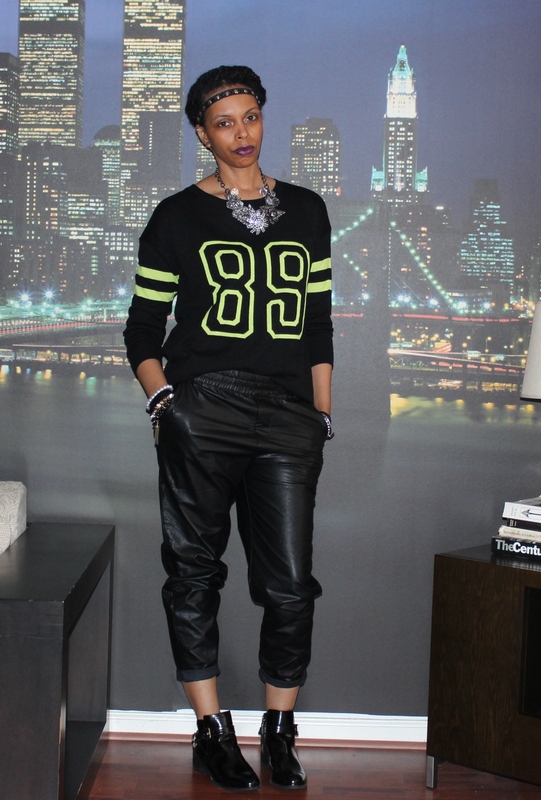 I love the neon green with all the black for a pop of color. Real casual but I like to add a bit of glamour with a blingy statement necklace. The booties are a favorite of mine. They’re really just a plain patent leather ankle bootie but the gold chain detail on the back makes them a bit more special. Well, gotta run! Hope you had a great weekend! God Bless! Sunday: The weather has been cooperating a bit so I decided to go barelegged today. 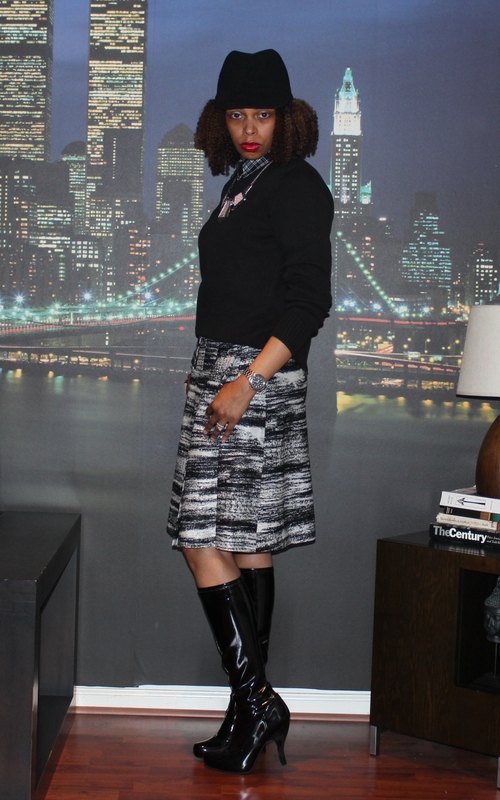 I’m wearing a wool skirt that has silver metallic yarns woven into the fabric. The skirt is actually quit old. Probably well over 3-4 yrs ago I bought it and it’s just been sitting in my closet until today. 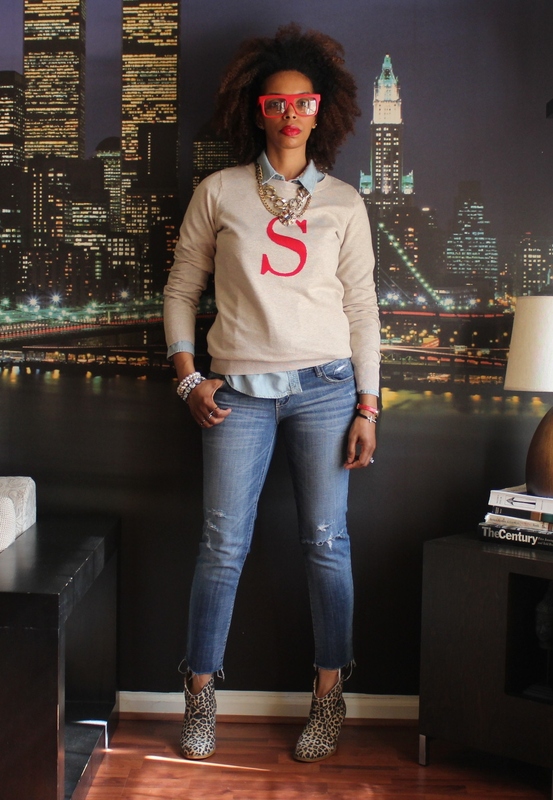 It actually can go pretty conservative but I styled it with this more casual letter sweater instead. And the platform booties just adds a touch of edge to the overall all ensemble. O yeah, I finally found a new silver statement necklace that fit my expectations. Short and sweet tonight. Hope you all had a great weekend! Praying that this snow they’re calling for doesn’t hit us too bad! This has to be the last one! Spring does start later this week! God Bless! Sunday: So I thought I was gonna get some outside photos today since it was so nice but the wind was just too much! I almost had a Marilyn Monroe moment and that’s not a good look! So, back in the house it is. 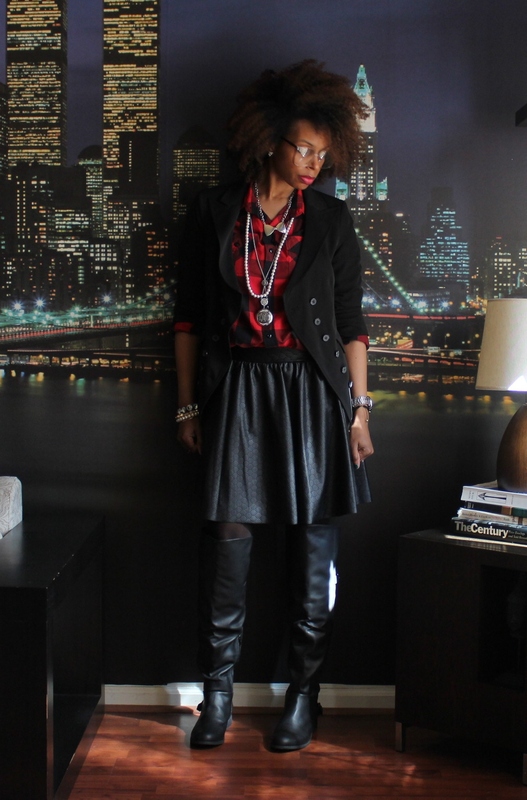 As for the outfit, I went for a mixture of colder weather and warmer weather pieces. 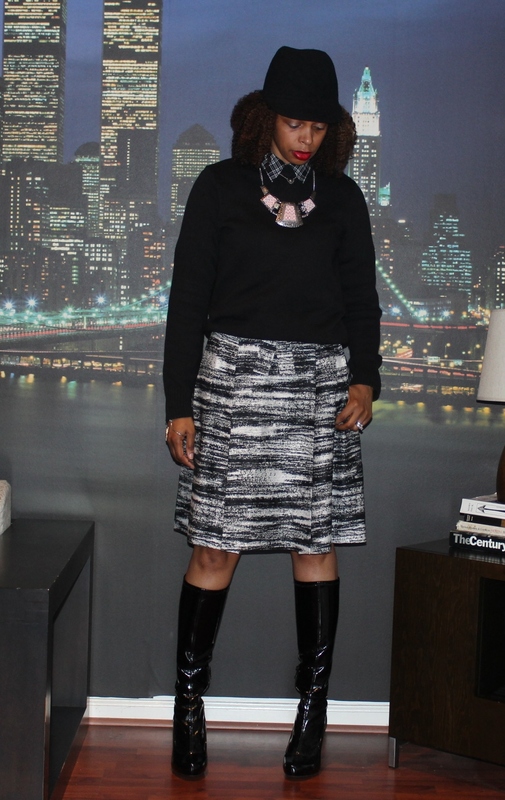 The faux leather skirt can be worn right now with tights (as I am doing) or once it gets a little warmer, can be worn barelegged. It is lined so I probably won’t wear it once it gets too warm. Plus for church, I thought it was more appropriate to wear with tights and OTK (over-the-knee) boots to have more coverage and less leg exposed. 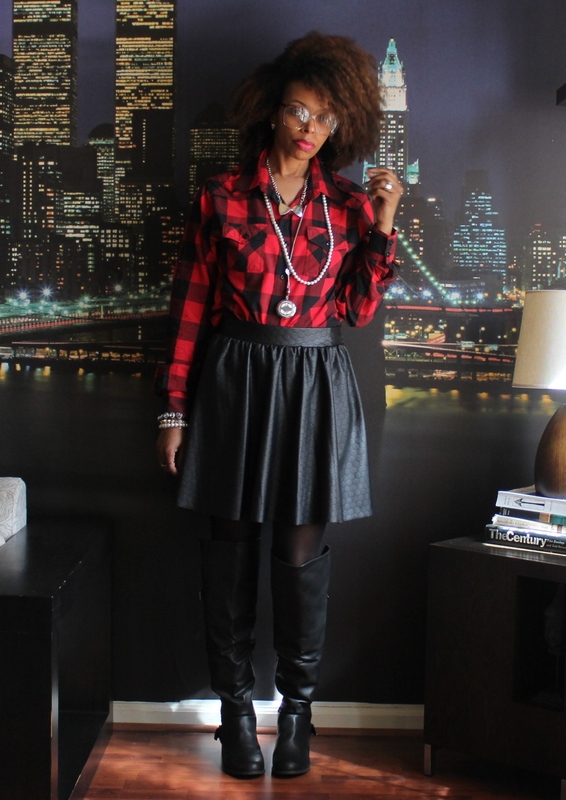 The plaid shirt makes the look more casual along with the flat with the flat boots. And my obsession for glasses continues! 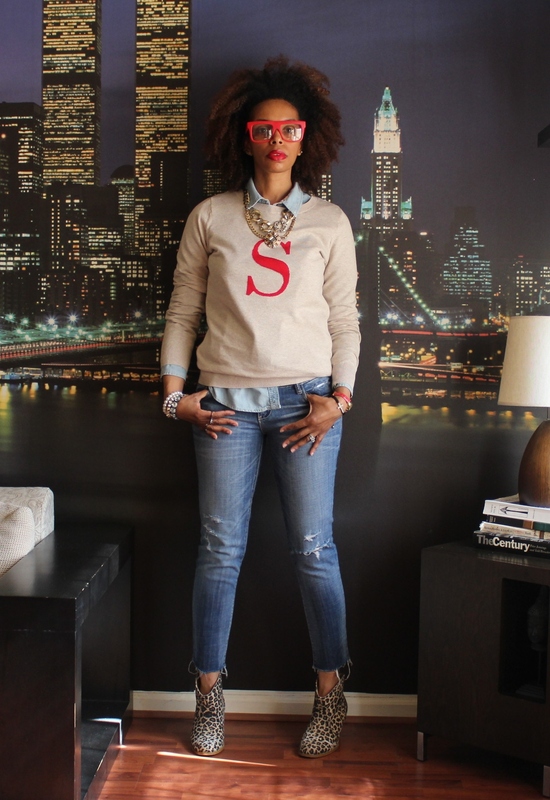 I found these old school inspired frames that I love so I had to style them with my look today. Hope you had a great weekend! Yay for Daylight Savings time! Longer days, more daylight and I didn’t even miss that hour that we lost! Spring is getting closer! God Bless! Sunday: Matching knit wear ensemble today. The top is actually a crop top but of course I had to layer it to make it church appropriate. Plus I like how the longer button down looks layered with the crop top. 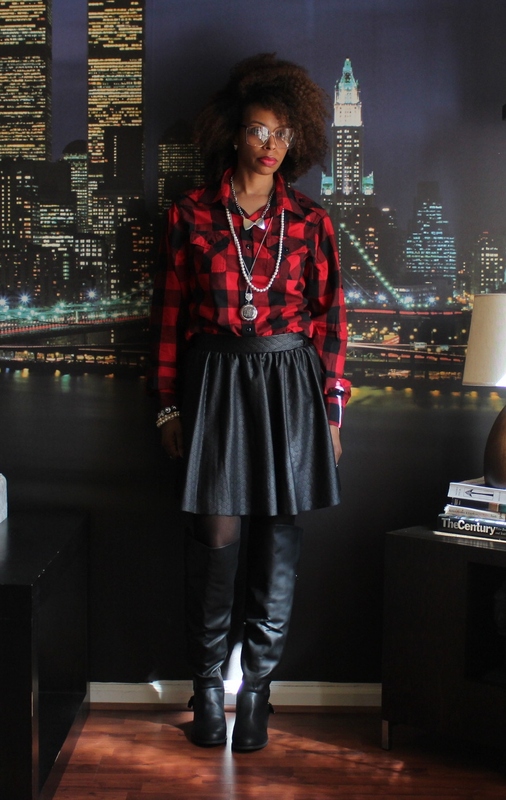 I wore the rugged boots because I liked how they looked with the whole ensemble. Accessory wise, I opted for the heart broach instead of a statement necklace and an understated pair of earrings. A little sparkle, but understated accessories, none-the-less. 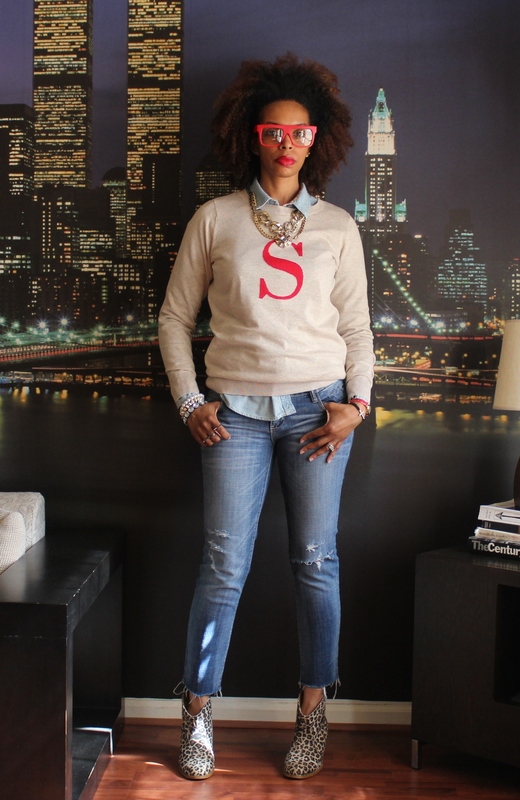 Well, until next time, remember: “Style is a way to say who you are, without having to speak” Rachel Zoe. Be safe as we prepare for yet another snow event! Gosh, I can’t wait to be able to take photos outside again! God Bless! Saturday: A casual Saturday calls for a casual outfit. The initial sweater was purchased during the after Christmas sales. I love good knit, especially the lightweight ones that can be worn layered during the colder months and then alone during the Spring. I even love to rock them during the Summer with shorts (when it’s not too hot or in the evenings). 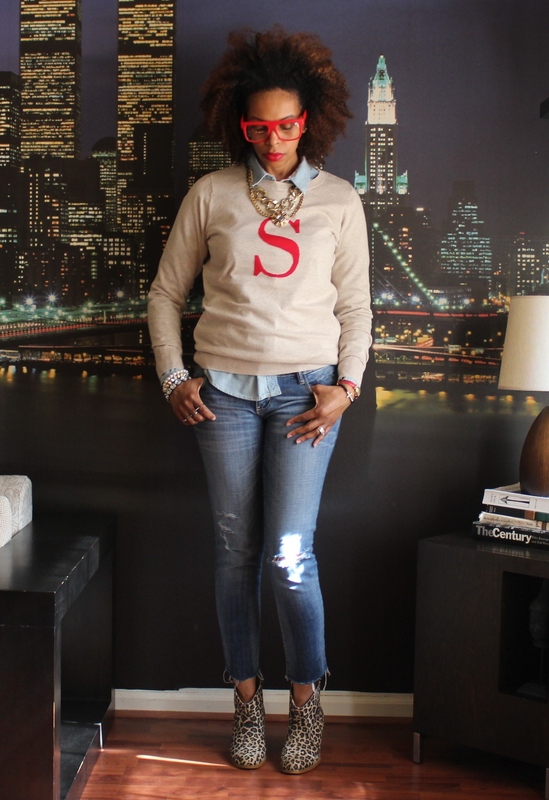 It’s such a preppy piece but I styled it with these distressed jeans to give it a different look. And of course, the leopard booties are a neutral for me. They go with almost everything! They can take an outfit to another level. 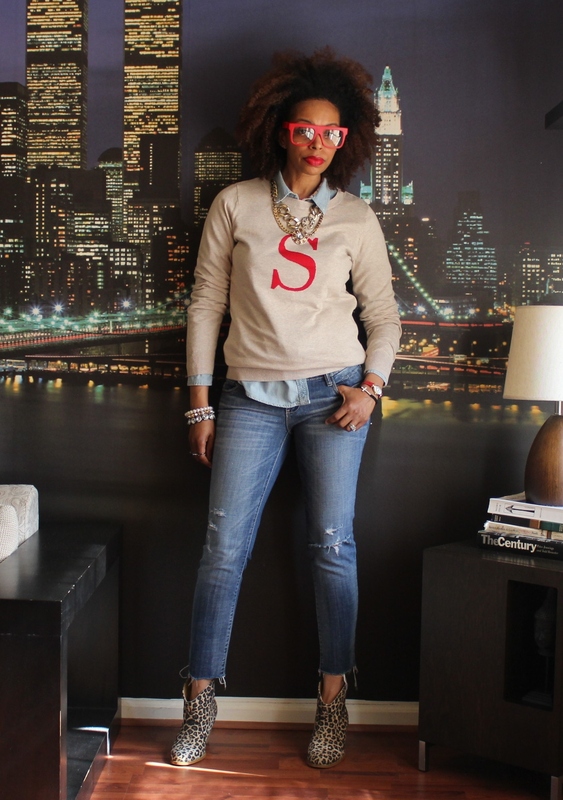 And how bout these red glasses! I love them! 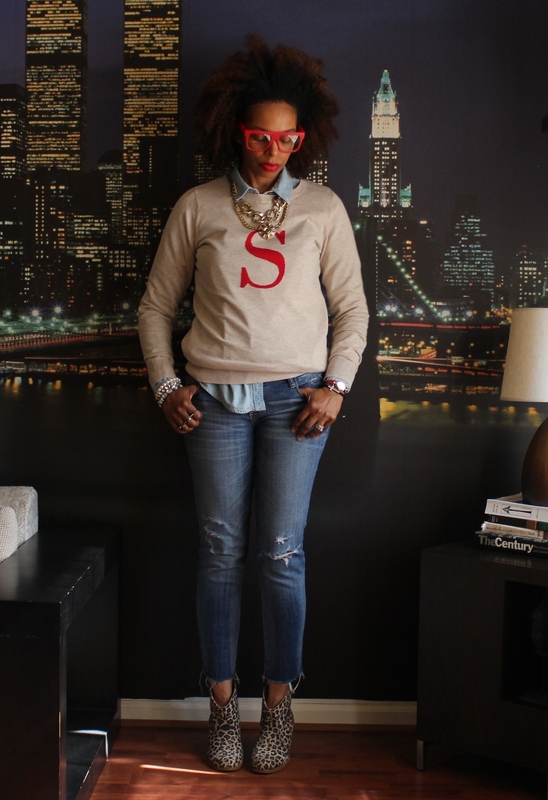 I am obsessed with fashion glasses and have been looking (passively) for some red ones. I may not wear my prescription glasses often but I will rock some fashion frames! Alright, that’s all for now. Got another post to do. God Bless!